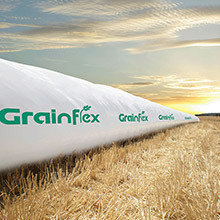 Latest technology seven layer grain bags made from a combination of remarkable new polymers, GrainFlex® bags are suitable for all human and animal grain applications, and performs well with modern high capacity in and out loaders. GrainFlex® bags are manufactured to strict ISO9001 QA standards from seven-layered co-extruded polythene film using the highest quality performance resins and additives. Manufactured in Canada by RPC-bpi to strict ISO9001 QA standards. GrainFlex® 7 SmartStructure Technology Tubes fit all 2.75m (9ft) diameter grain loaders.